It’s YOUR birthday! 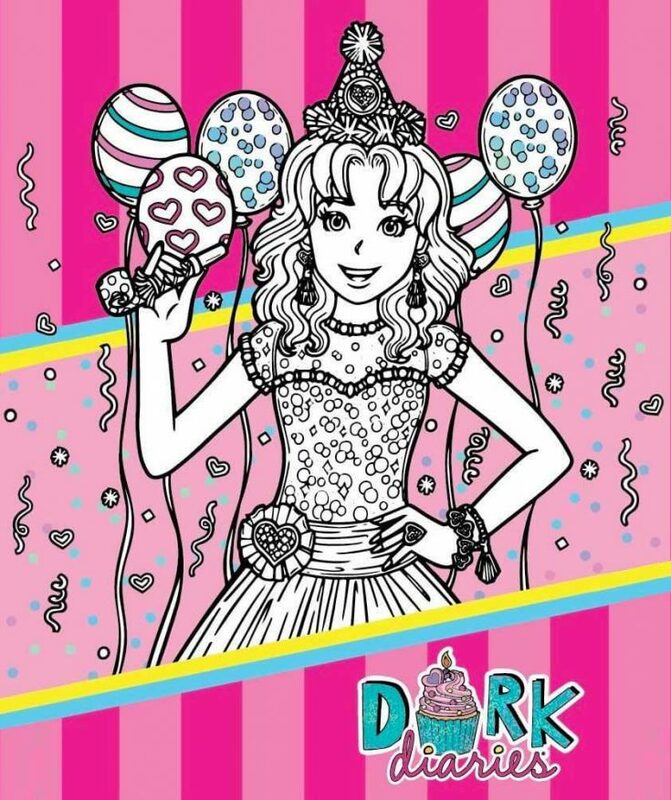 You’re throwing the ULTIMATE birthday party just like Nikki did in Dork Diaries Book 13! Describe the type of party you’re having and what 12 guests are on your fantasy guest list. You can invite friends, celebs, and your fav TV/movie/book characters! I can’t wait to read your answers in the comments below! I would invite my BF Alexa, my family, *Nikki Maxwell, Taylor Swift, all my cupcake club members. What’d we eat- OREO ICE CREAM CAKE!!! SQUEEEEEEEEEE! Activities- I don’t really know except for TRUTH OR DARE and SPIN THE BOTTLE!!! That’s MY absolute DREAM party! I hope it would really happen,though I made it sound INCREDIBLE. I would invite Qian Yu,Anne,Claire,Emma,Charlotte, Sarah,Rachel,Tory & 4 more. And we will have a glow in the dark book party. I would have my birthday party theme princesses because i like playing princess monster games at recess. i’d invite princess black, princess daisy, princess Skittles, and princess i forget her name in the game. also my three other friends that aren’t from school . we would also go bowling because we love bowling. maybe pizza for food. Cake type: CHOCOLAAAAAAAAAAAAAAAAAAAAAAAAAAAAAAAAAAAAAAAAAAAAAAAAAAAAAAAAAAATE CAAAAAAAAAAAAAAAAAAAAAAAAAAAAAAAAAAAAAAAAAAAAAAAAAAAAAAAAAAAAAAAAAAAAAAAAAAAAAAAAAAAAAAAAAAAAAAAAAAAAAAAAAAAAAAAAAAAAAAAAAAAAAAAAAAAAAAKE!!!!!!!!!!!!!!!!!!!!!!!!!!!!!!!!!!!!!!!!!!!!!!!!!!!!!!!!!!!!!!!!!!!!!!!!!!!!!!!!!!!!!!!!!!!!!!!!!!!!!!!!!!!!!!!! It was my birthday a few days ago!!!!!!!!!!!! I LOVE LOVE LOVE BIRTHDAY PARTYS!!! I would have a movie night theme especially because i have a home cinema! I would invite all the CCPs of my school (my bffs are CCPs) and as celebs i would invite like all the Nickelodeon stars! We would also browse for YT vids especially of ZaiLetsPlay( i love that gurl)! I’m having a party at the coral reef!!! I would invite Nikki, a unicorn, Beatrice, the Queen, Matilda, JK Rowling mermaid, Ariana Grande, BFF, Rachel Renee Russel, Zoey, Chloe. People I’d invite: My BFFs, Tina Fung and Grase Chen, my pops, Taylor Swift, Ed Sheeran, Charlie Puth, Rachel Renee Russel, Katie Perry, Orlando Bloom, Lania Carnfield, Hannah Holmer, Arwen from Lord of the Rings, etc. Mackenzie why were you so mean and snobby to nikki i know you guys are friends now but still why were you so mean to nikki ? My invitation: – Hannah cotrington. -Indy Hutchinson – Hayley cotrington. -Jesse mackdonld. ( who btw my crush). -kanishka shamra. -kealan -acacia Jackson. I would bring everyone on Disney channel my family panton squad and Aj mobb mostly everyone. My theme would be Horror cuz I’m a edgy kid also I love Identity V and I want to play Identity V but in real life. Decoding ciphers, running from hunters, and more! I love horror more then any other genre because its super exciting! My party theme would be SUPERHEROS. And I would invite my friends, Jose, Natalie, Ohanna, Carina, May, and Ishika. I would also invite Aquaman, Starfire, and the Flash, they’re all cool. I would also invite all 7 members of BTS, all 4 members of BLACKPINK, my cousins, Funnel Vision(yes, i still watch them), Nikki, Chloe, Zoey, Slime Chu (a slime maker) and Brandon and all the dogs in the world! This is all in my imagination, my parents wouldn’t even let me have a party!